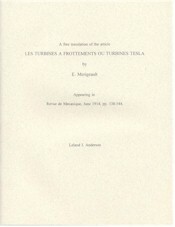 This is a free translation by Leland Anderson of a paper on the Tesla turbine which appeared in the French periodical Revue De Mechanique in June 1914. The author provides a complete description of the basic machine along with an analysis of its operation, stating that "it is theoretically possible to obtain attractive efficiencies" with these devices. The text closes with a questionable design change said to improve the turbine's performance. Includes a commentary by Jeff Hayes and a reproduction of the original article.